The synthetic cannabis overdose epidemic continues on Skid Row. Officials say that 18 people overdosed on what they presume to be spice. Synthetic cannabis strikes again on Skid Row. Officials say that 18 people overdosed on what they presume to be spice. Not only did officers have to respond on Monday, but also on Friday for the same reason. In fact, there are so many spice overdoses in the area that officials call it a public health crisis. Under those circumstances, officials say that team effort is imperative to find a definitive solution. Paramedics rushed to Skid Row once again on Monday. According to fire officials, 18 people appeared to be overdosing on synthetic cannabis, also known as spice. At about 10:30 in the morning, the Los Angeles Fire Department responded to the area of 5th and San Pedro streets. When officials arrived, they evaluated 18 people, and 14 of those individuals had to go to the hospital for further treatment. According to officials, all of the victims experienced similar symptoms. In particular, they suffered from combative behavior, altered mental status, and even seizures in some cases. Dr. Marc Eckstein, the Los Angeles Fire Department medical director and EMS bureau commander made a comment on the matter. We don’t have toxicological confirmation, but it’s presumably spice, which is a synthetic type of cannabis or marijuana. And of course, because it’s synthetic, nobody for sure knows what active ingredients are in there, the strength is variable. This seems to be very similar to what we had here on Friday. The drug use here is very widespread amongst the homeless population here in the Skid Row area. People would use or smoke spice at their own peril, they’re taking their lives into their own hands. Under those circumstances, officials call the rise of spice overdoses over the summer a public health crisis. For this reason, officials are working together as a team to come up with a solution for the ongoing problem. We’ve seen transports of patients with these types of symptoms all summer, but obviously Friday and today appear to be peaking so we need to work with our partners to come up with a definitive solution. According to LAPD Capt. Don Graham, the homeless population downtown is extremely vulnerable to crime and temptation of the illusion that a “magic cigarette” will take their worries away for a day. 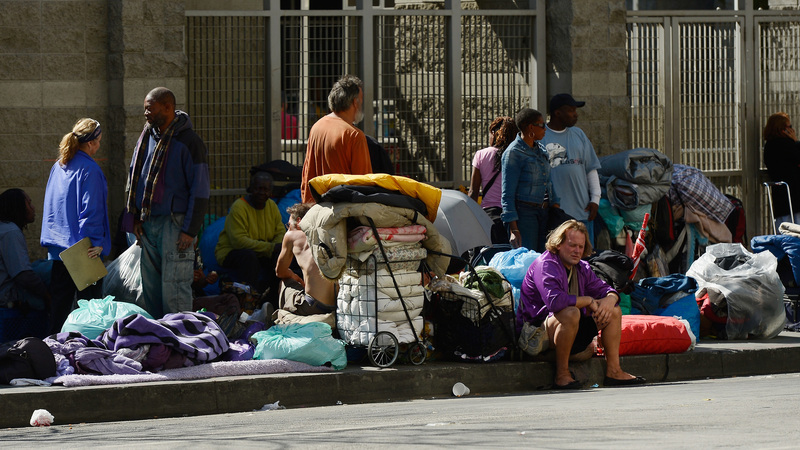 The homelessness in downtown L.A. is what’s actually harming these people, because they are subject to attack, they are subject to these rampant drug dealers, they’re subject to just the random violence that can occur in someone who’s suffering from mental illness. The price of spice is another reason why the drug is spreading so quickly. For as little as a dollar, the homeless can walk away with a stick of it. Moving forward, the LAPD is urging those who may have spice to get rid of it. Also, they are confiscating any that they come across. Being that spice is strictly illegal to sell and not to smoke, they are focusing their efforts on dealers. Have you ever tried synthetic cannabis? Did you have a bad experience? Share it with us on social media or in the comments section below. We would love to hear from you.